Clean the storage tank or reservoir. Remove debris and scrub or hose off any dirt or other deposits or interior surfaces. Pump to remove any suspended solids or foreign matter in the water if possible. Scrub interior surfaces of storage or reservoir if applicable with a strong chlorine solution containing ½ gallon household bleach, or ¼ gallon of pool chlorine to each 5 gallons of water. Inspect the storage tank for cracks, leaks around the lid or man-way, or vents. Make sure no insects, rodents or other debris can enter the tank during normal operation of the tank and water system, by making sure the lid is tight fitting, and any vents are properly screened. Use the chart below to add enough chlorine bleach in the tank, to bring up the chlorine residual in the tank to the desired level. 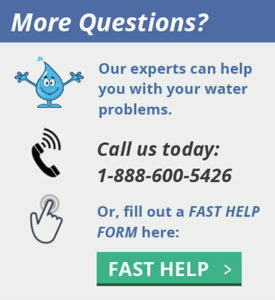 If you are using the water from the tank and need to continue to use the water in the tank after chlorination, consider adding enough chlorine to bring the levels up to 5 or 10 ppm and let sit for 12 hours or more. If using pool chlorine(12% sodium hypochlorite) use half the amounts below. Storage Tank Gallons Approx. parts per million of chlorine residual achieved by adding 5% chlorine bleach, in the amounts below. If a thorough disinfection is needed and time is short, use a 50 ppm or 100 ppm residual and let sit for 2 to 6 hours. Drain and flush tank if using these higher levels of chlorine. Don’t put large amounts of chlorine residual into drains leading to septic tanks, and avoid discharge into creeks, rivers or lakes. Be careful if you have a steel storage tank, as corrosion may have occurred over time, and once the tank is cleaned it may develop leaks. To disinfect a storage tank mix non-scented NSF-approved household bleach (5.25% chlorine) in the reservoir at the ratio of 1 gallon of bleach for every 1,000 gallons of water (i.e., 1 quart for every 250 gallons of water). This will give a chlorine concentration of 50 ppm. Add bleach directly to the storage tank at the same time you are disinfecting the well. Let the storage tank drain into the distribution system. After sitting for 12 to 24 hours, drain the storage tank through a drain valve or through the distribution system. Do not dispose of chlorinated water into septic tank or on vegetation or into surface water. If you cannot find NSF certified chlorine bleach use NSF certified chlorine pellets or powder. 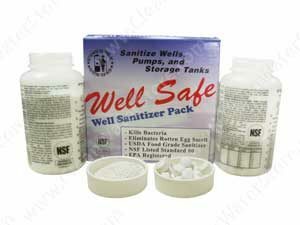 Click to see Well Safe Sanitizer Kit. Storage Tank Gallons Approx. parts per million of chlorine residual achieved by adding dry chlorine pellets in the amounts below. 1 cup = 8 fluid oz. 1 pint = 16 fluid oz. 1 quart = 32 fluid oz. 1 gallon = 128 fluid oz. 1 fluid oz. = 29.6 milliliter (ml) 20 drops = 1 ml.